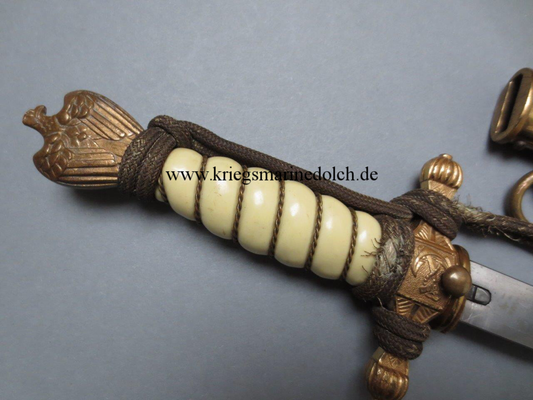 Der Hersteller Robert Klaas aus Solingen zählt zu den kleineren Herstellern von KM Dolchen. Die Einzelteile wurden von größeren Herstellern zugekauft, da eine eigene Fertigung wahrscheinlich zu kostenintensiv wäre. 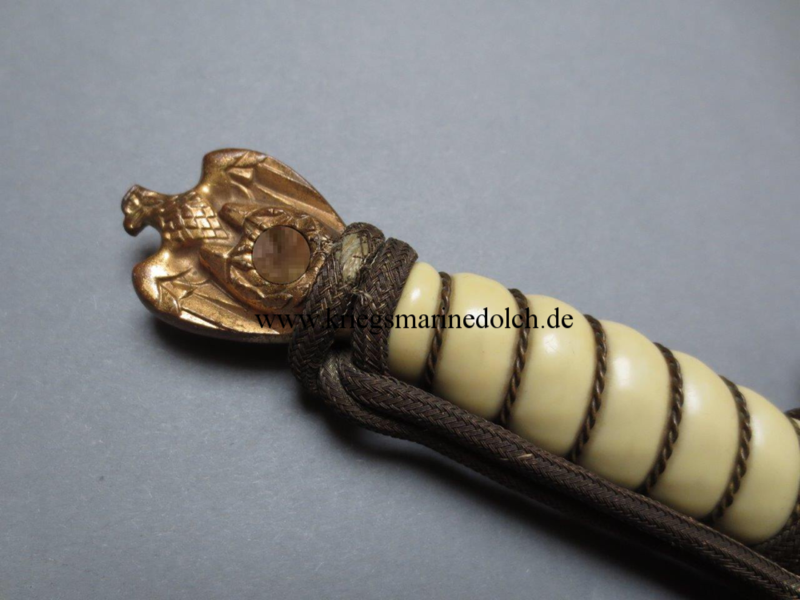 Der Hersteller hat bei den KM Dolchen 1 Herstellerlogo verwendet. 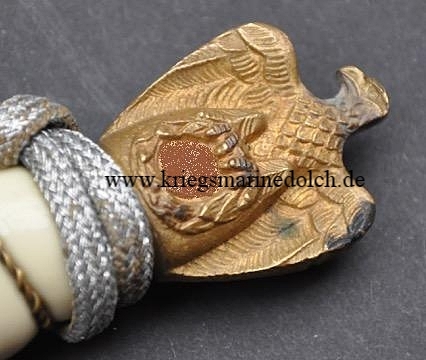 Bekannt ist er vor allem als Hersteller des KM Dolchs mit dem Unterseeboot auf der Klinge, genannt "U-9", geworden. Die KM Dolche dieses Herstellers sind am Sammlermarkt nur selten anzutreffen. This Third Reich naval dagger is highly sought after by collectors, but with so few examples available the prices are approaching $10,000.00, and in a few short years will become out of reach for the vast majority of collectors. 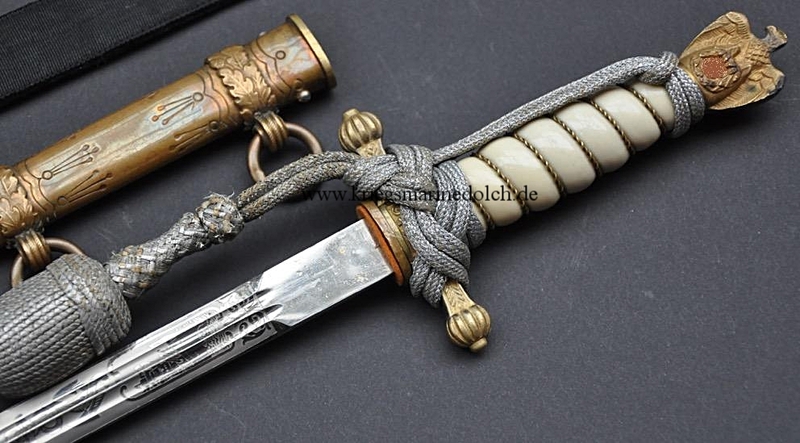 Surprisingly little has been written about this rare dagger which aids the collector faced with such a large cash outlay. 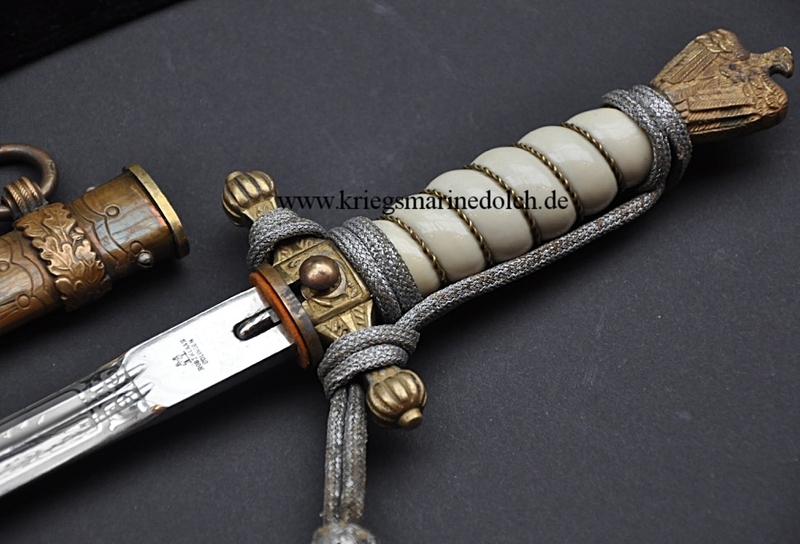 To greater disseminate knowledge about this dagger I am sharing my notes regarding the 3 U9’s from my collection as well as well as other examples I have extensively studied in the US, Germany and France. In our book Deutsche Marinedolche Hermann and I have provided the best high resolution photographs of this rare dagger. As you are reading these notes it will be helpful if you refer to pages 299 to 303 of that book. 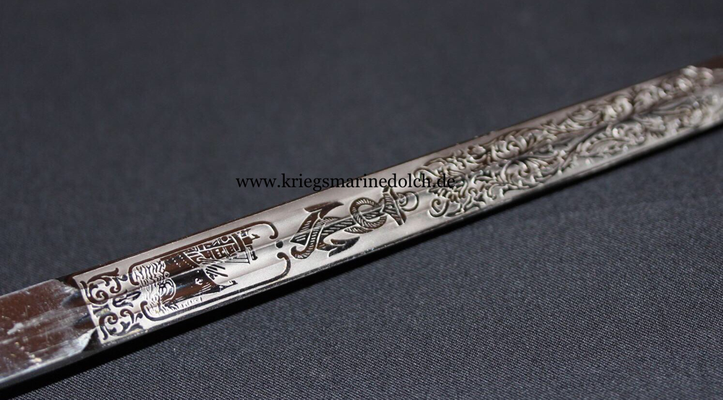 The etch on this commemorative U9 blade celebrates the action by the U9 on 22.September 1914. On this fateful day Kapitänleutnant Otto Weddigen was patrolling his tiny 188 foot kerosene-powered U-Boat in the waters off of the Hook of Holland when he encountered the three armored British Cruisers the HMS Aboukir, HMS Hogue, and the HMS Cressy, moving between the U9 and the coast. It has been reported by numerous sources that the cruisers were not zig-zagging as required. However when looking at the drawings that Weddigen entered into his original War Diary, it appears the cruisers were beginning this maneuver resulting in a roughly triangular formation that provided Weddigen with a “shooting gallery”, sinking all three Cruisers with the loss of 1,459 British lives in less than an hour. The Alan Coles book, Three Before Breakfast: presents a true and dramatic account of this famous engagement. The sinkings action were hailed throughout Germany and Weddingen was awarded the Iron Cross First Class. The 4 officers and 25 men on the ship were awarded the Iron Cross 2nd class. This action also opened the eyes of Navy men everywhere to the awesome power of the U-Boat and it destructive potential. The UBoat was awarded the Iron Cross and was the only UBoat allowed to wear this award on it’s conning tower. Weddingen was also awarded the Pour Le Merite. A search of medals and day badges of the 1939 period reveals a 25th year anniversary of the sinkings throughout Germany. It is most likely that the U9 blade was produced at this time to cash in on the celebration. Repeated inquires with the Firm of Robert Klaas have not provided no additional information. During the 1939-1940 period there was a second U-Boat 9, commanded by the famed submariner Wolfgang Lüth. 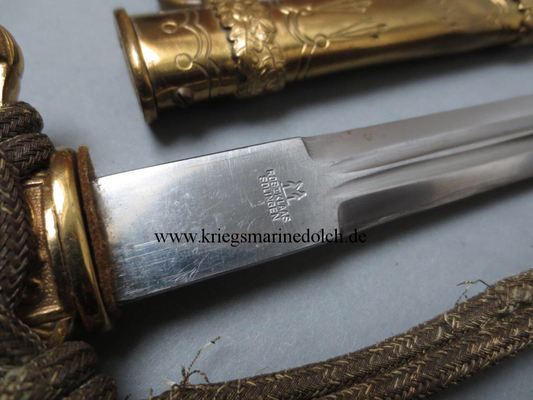 It is entirely possible, since the blades were in production, that officers of Lüth’s boat may have purchased U-9 blades, even though most of Lüth’s fame came from his success commanding other U-Boats, the U 138, U 43 and the U 181. 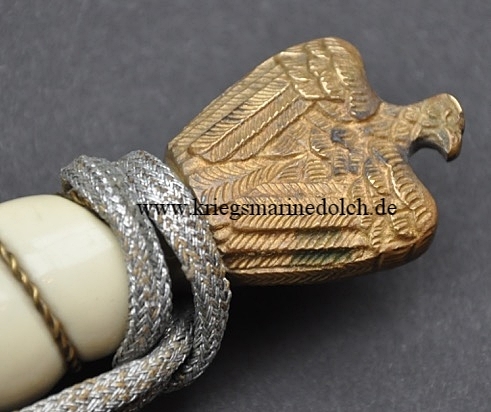 The construction of examined U-9 daggers point to a 1939-1940 period of manufacture. 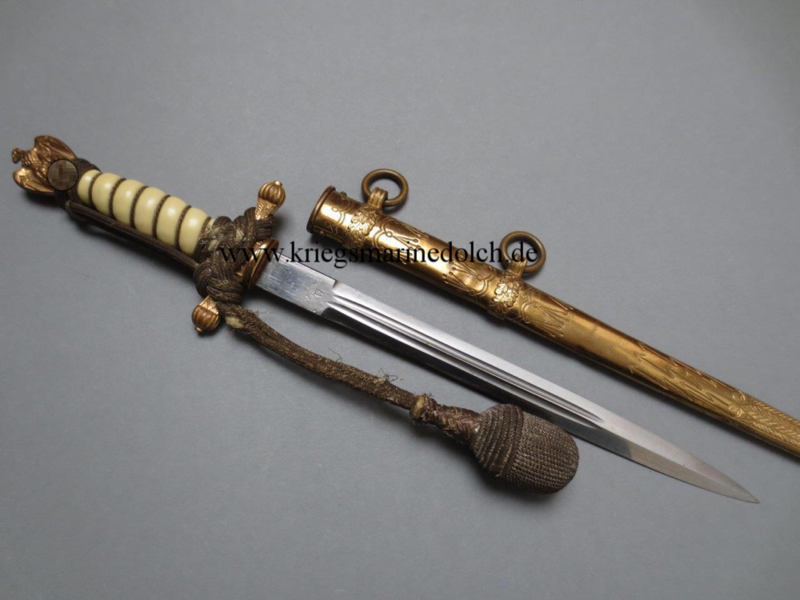 The hilts of a number of these daggers contain generic fittings and two contain fittings from other manufacturers, which repeatedly happened during this time as parts became scarce as brass became a strategic war material. Three different scabbards have been observed with these daggers, i.e. 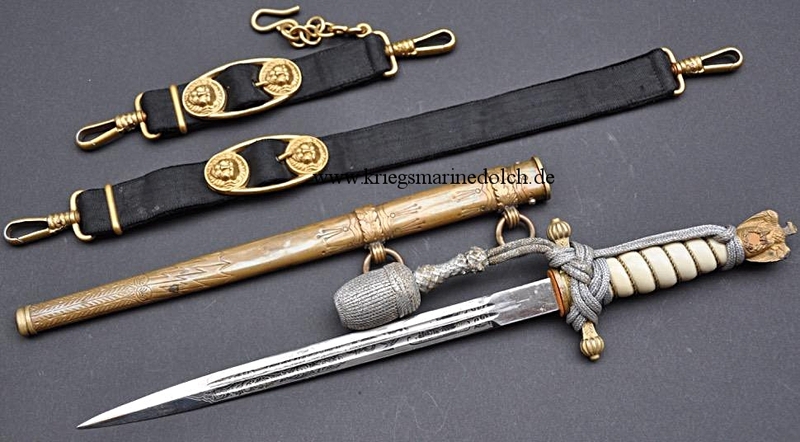 the standard Klaas lightning bolt, a hammered scabbard with an overhand knot suspension band discovered in France and an obviously late production Blitz scabbard with metal scabbard liners, which of course played havoc with the beautifully etched U-9 blade. As stated the U-9 blade is flawlessly etched. 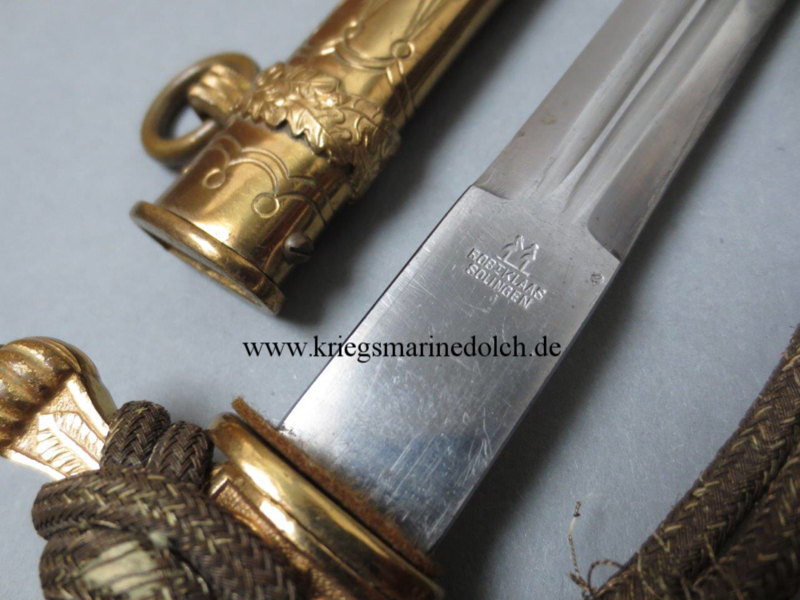 As another example of later period manufacturer two different blade blanks are found. The centerfold picture picture on page 298 represents one of these blanks and its important physical characteristics. Close examination reveals a box type ricasso which contains the Rober Klaas stamped trademark. 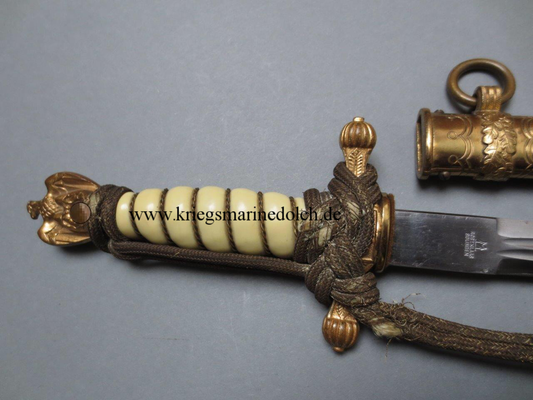 This stamp is on the obverse but others have been stamped on the reverse of the blade. Some of the stampings are off center and slightly askew of the center of the ricasso. 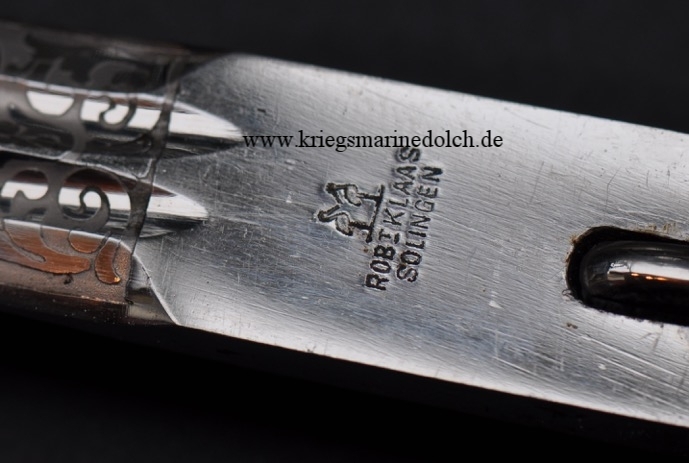 The box ricasso pictured here creates an abrupt change between the ricasso and the edge of the blade This blade stamping contains short fullers which do not extend through the etch. The other observed blade stamping contains a tapered ricasso which gracefully extends into the edge of the blade. 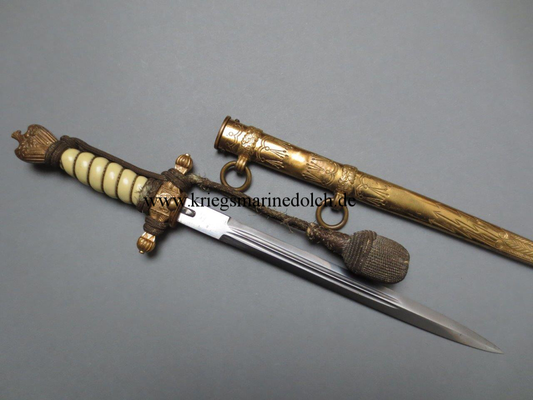 This blade contains long fullers that extend through the U-9 etch. The trademark stamping on this blade may be found on either side. 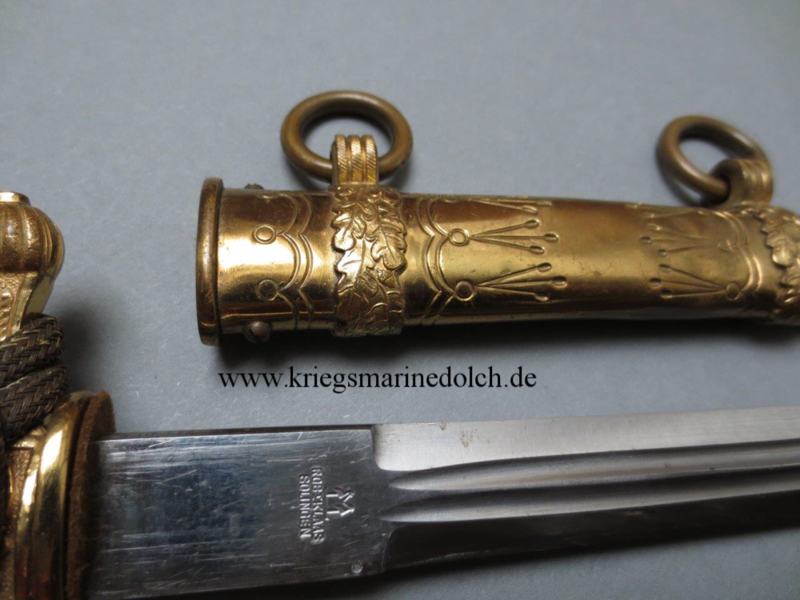 Returning to the etch of this dagger the blade obverse contains the battle ship and fouled anchor while the reverse contains the meticulously completed U9. The U-Boat design used was not based on the World war one boat. When looking at the U9 etch, be sure to see the 3 sea gulls following the ship as well as the details of the waves and communication lines. Collectors should note that the design on the conning tower is not a number but a life preserver. The U 9 is found on the bow of the ship. The U is perfectly formed as is the 9. 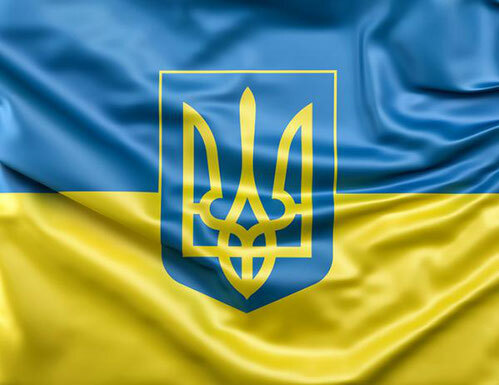 The circle of the nine is open at the bottom. 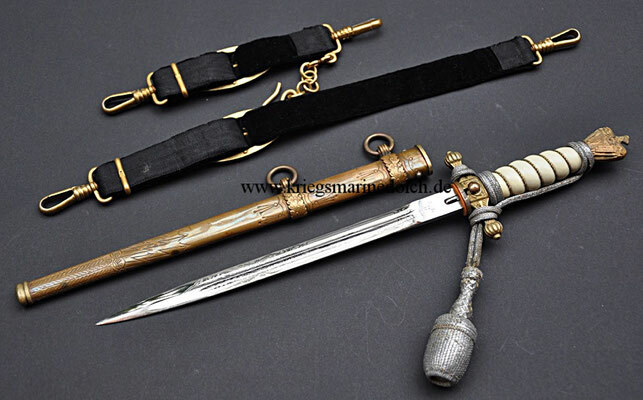 This completes the discussion of the important characteristics of this famed dagger. If collectors can add to this information in any manner it is invited and will be well received. Unten sind die Bilder eines "U-9" KM Dolchs von Robert Klaas. Ein KM Dolch des Herstellers R. Klaas mit der blanken Klinge. Die Teile des Dolch scheinen diesmal von der Fa. Eickhorn zugekauft gewesen. Sammlung: dr73, Niederlande.